(CNN) -- Police hunting for a New Zealand couple who allegedly fled the country after a bank mistakenly paid them $NZ10 million ($6 million) believe they traveled to Hong Kong. 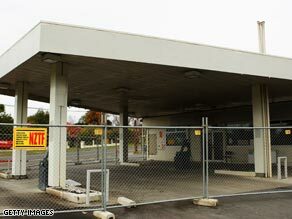 The gas station owned by one of the duo has been closed since May 7. New Zealand authorities have sought help from Interpol in locating the couple who disappeared May 7, two days after an employee error at Westpac bank paid them 1,000 times the amount they asked for. TVNZ, a CNN television affiliate, named the couple as Leo Gao and his girlfriend Cara Young. Gao owned a gas station in Rotorua, a lakeside tourist town famous for its hot water springs and bubbling mud pools. Police said Friday that the couple were believed to have traveled to Hong Kong. Police were not confirming the identities of those involved but they were working with the family of one of the individuals named in the media, Harvey said. The family were shocked at their name being associated with the case, he added. TVNZ said the couple applied for an overdraft from Westpac worth up to NZ$10,000. However, on or about May 5, the bank erroneously put NZ$10 million ($6.1 million) into their bank account. What would you do in this situation? The next day, the gas station closed its doors. And the day after, the couple went missing. TVNZ said Westpac had confirmed that a customer had attempted to unlawfully transfer amounts totaling around NZ$6.7 million ($4.1 million). Nearly NZ$3 million ($1.85 million) had been recovered and the bank was continuing to vigorously pursue the outstanding amount, Westpac Media relations manager Craig Dowling told the station.